Cerner training isn’t a single event. 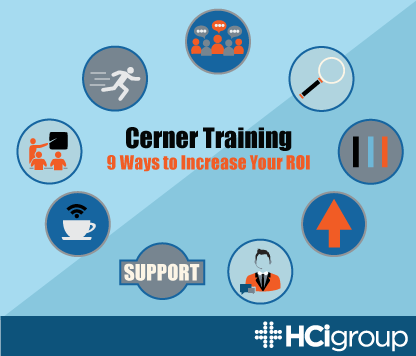 The HCI Group identifies 9 Cerner training strategies that will increase the return on your EHR. The first 3 strategies are covered in this post. Maximizing your ROI for a new Cerner EHR (Electronic Health Record) requires formal and informal training opportunities—before, during and after a Cerner Go-Live. Mixing methods, such as classroom sessions, learning labs, and virtual training, will increase the effectiveness of your Cerner training by allowing users to learn according to their needs, schedules, and abilities. Users will also retain more of their knowledge if training is realistic and applicable to their positions—for example, treating common problems and symptoms for Emergency Department physicians and nurses based on case studies derived from actual patient visits. By increasing work efficiency through preparatory training, users will help your organization improve patient care, reduce costs, and preserve revenue integrity. Additionally, ongoing Cerner training can be particularly beneficial for optimizing workflows. The rich reporting of your Cerner EHR tracks key revenue and quality metrics, thereby allowing you to spot problems that can be solved with targeted training. Issues such as poor barcode scanning compliance rates can be solved by simply teaching nurses the proper distance to hold medications from the barcode reader. A user will be more likely to embrace their training if it is tailored to their department and position. Facilitate collaboration and buy-in among your information technology and operations teams by assembling a training advisory group (TAG) comprised of representatives from all constituencies, including clinicians and non-clinicians. Include key members of your organization, such as your chief medical officer, nursing directors, and revenue cycle leaders, so that you can assess your training needs holistically. Addressing training broadly by accounting for how the EHR gathers and disseminates information between departments allows you to customize training to fit each user group narrowly. For example, you can train clinicians and staff to code according to your patient-billing protocols. Initially, your TAG can meet every two weeks. However, ramp up meetings to at least weekly as you near go-live. Involving the group early and often will help you tap its collective knowledge and experience, incorporating lessons that members may have learned from previous go-lives. As Cerner becomes more popular, it is increasingly likely that your physicians and other clinicians may use it elsewhere in the community. So, they may already know how to use your EHR’s core functionality, even though your organization’s clinical content may differ. Rather than wasting their time in needless training, focus your clinicians on learning only what they need to know for your organization. Offer them a simulation-based test. If they pass, they can then get organization-specific information through a virtual training platform or learning lab. They will appreciate you accommodating their busy schedules and will be more likely to apply the targeted training that filters out distracting information, allowing them to focus on the most important takeaways. Knowledge itself isn’t power—the application of knowledge is power. Your team will apply knowledge if it realistic and relevant to their jobs. Thus, real-life scenarios provide the most compelling Cerner training. Garner case studies by speaking to front line staff about a typical workday. Then, create training environments that mirror your production environment, so that you can simulate a live system as closely as possible when conducting training based on real scenarios. You can also increase learner engagement and knowledge retention, and thus application, by matching trainers to users according to their backgrounds. Physicians learn best from other physicians, while coders gain most by working with other coders.